Edinburgh is the capital and second largest city (after Glasgow) of Scotland, in the UK. Edinburgh has in fact been the Scottish capital since 1437, and seat of the revived Scottish Parliament since it first met in 1999. As of the 2001 census, Edinburgh had a population of 448,624. 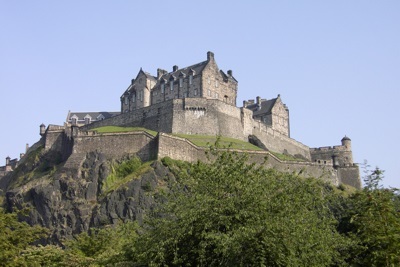 Perhaps the best known building in Edinburgh is Edinburgh Castle which overlooks the city from Castle Rock. There is archaeological evidence of human habitation on the site since at least the 9th century BCE, but most of the castle buildings actually date to the 16th century - the exception is St. Margaret's Chapel which was built in the early 12th century, and is in fact the oldest building in the whole of Edinburgh. Other noteworthy sites in Edinburgh include the highly distinctive Nelson's Monument (on Calton Hill), and Arthur's Seat, the latter being an unusual geological formation created from an ancient extinct volcano eroded by glaciers during the ice ages. Edinburgh is home to many festivals and events, especially during the Summer months. Many people have heard of the Edinburgh Fringe (the world's largest arts festival), the Edinburgh Festival (arts and culture) and Edinburgh International Festival (performing arts). There are also several other excellent but slightly lower profile festivals: the Edinburgh Art Festival, the Edinburgh International Film Festival, the Edinburgh Jazz and Blues Festival, the Edinburgh International Book Festival, and the Edinburgh International Science Festival. Additionally, the Edinburgh Military Tattoo, a show involving military bands, pipers, and fireworks takes place nightly for around 3 weeks at the Castle Esplanade during the summer (buy tickets in advance if you want to attend, all tickets sell out quickly in advance of the tattoo). Edinburgh is the capital and second largest city (after Glasgow of Scotland. As capital of the country, Edinburgh is home to the Scottish Parliament, which is located in the Holyrood area of the city. The city is located on the southern shore of the Firth of Forth. 43% of the population of Edinburgh hold a degree or professional economy. The gross value added per employee is the second highest of any city in the UK (after London). Edinburgh is also known for its university, which is considered to be one of the top 20 universities in the world. Edinburgh Airport is the busiest and biggest airport in Scotland. It handles both international and domestic flights. Rail links to Edinburgh mainly go through Edinburgh Waverley station, which is in the city center, and is one of the main stations on the East Coast Main Line which connects London to Aberdeen. Edinburgh also has a small suburban rail network, the core of which is Edinburgh Crossrail which has been operating since 2002. Edinburgh's roads tended to be congested. This has been ameliorated somewhat by the suburban rail system, and a very extensive bus network (including six park and ride sites). 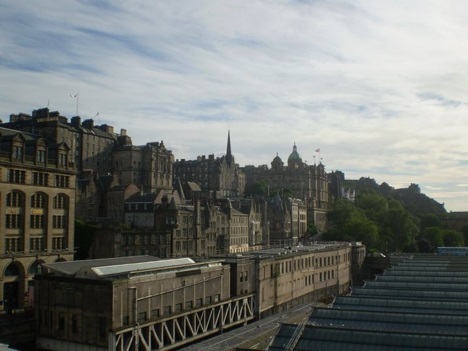 Residents of Edinburgh however rejected introducing a congestion charge in a referendum in 2005. A controversial tram scheme is currently under construction, with initial operations expected now to begin in 2014. The controversy has mainly arisen because of spiralling costs, and because the scope of the project has been significantly curtailed as the costs rose.